This year's 72-hour Roadcheck will take place June 4–6. Roadcheck, the intensive annual roadside inspection effort, which takes place throughout the United States, Canada and Mexico, is your best opportunity for making a positive impact quickly on your Compliance, Safety, Accountability (CSA) data. The special emphasis area at this year's Roadcheck is Steering & Suspension Systems. This whitepaper provides critical information to help prepare your drivers for Roadcheck 2019. 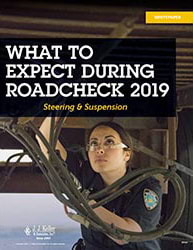 Fill out the form to download your free What to Expect During Roadcheck 2019 whitepaper.